This is Kuan Yin, outback on the bar. In the summer, the backyard patio becomes and extension of our home, offering more living space for the next few months. Plants go out there and we get to hang out there. Kuan Yin is the Buddhist bodhisvatta (or enlightened one) of compassion. 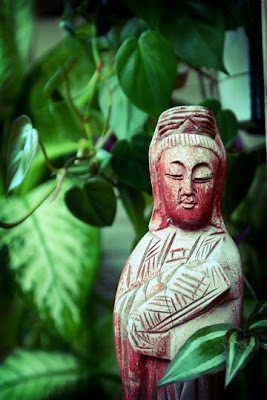 The Kuan Yin statue is one of a set of three that includes Happy Buddha and Confucious. These wood statues, which since they have gone outside have weathered in a really cool way, came from, of all people, my mother. I remember them in the house as a kid. I don't remember how they were displayed though. At some point my mother either gave them to me or I might have just taken them because I found them in a junk room but either way I'm certain these statues are 30 years old, at least. My mother was crazy but once in a while there was a cool side to her. This was one of them.